Most students will most readily recognize the Disney adaptation of “Beauty and the Beast” a lot quicker than they will the Russian version “The Enchanted Tsevarich”. In modern times, the tale has been molded into the ultimate love story: love defying social norms, surpassing understanding, changing the very identity of those involved. This is the trademark of most versions of the tale, albeit some circumstances are exaggerated to teach a lesson. After all, isn’t that what we expect our fairy tales to do? To impart life wisdom and shove cultural values down our throats, with mortal danger being the threat if we fail to adhere to the lesson. I like my fairy tales with a touch of darkness, so I chose to compare versions of “Beauty and the Beast” across the cultures that are deliciously dark and twisty. Through my examination of the French version (“La Belle et la Bête”) , the Russian adaptation (“The Enchanted Tsevarich”), the Portuguese version (“The Maiden and the Beast”), and the Greek adaptation (“Cupid and the Psyche”) I found the same overall premise to be that love is transformative. This has many variances given the different geographical settings where the stories originate. I will first start with the French adaptation “La Belle et la Bête” (Ashliman). Madame de Villeneuve’s “Beauty and the Beast” version was written in 18th century France. According to Jack Zipes, if we look at the historical context of the story, we see a story of class struggle. The merchant was very wealthy, and he and his 6 children (3 girls and 3 boys) lived well. The destruction of their mountain of wealth leads to their social upheaval from wealthy elite class to poor farmers. The underlying reason for their misfortunes following the social class upheaval seems to be their desire to return to their previous class stations. This is true at least of the merchant’s two older daughters, whose sole purpose seems to be to return to the town and take back their position and marry rich. As Elizabeth Stone referenced in “Victorian Influence in Beauty and the Beast”, this story also used Victorian ideals such as that marriage isn’t based on love and attraction, but wealth and status. At this point in French history, it wasn’t unusual to see arranged marriages that allowed one of the parties to become substantially better off than prior to the union. Using this as the setting for the story, it doesn’t seem so odd that a father would allow his daughter to go off with a person she hardly knows, with the understanding that her life and quite possibly the whole family’s life can be made better as a result. This was par for the course for arranged marriages in the 18th century. We also see how fluid the transition between classes can be. The loss of the merchant’s money instantly lowered his family’s status, since their position in the social class was purely based on material wealth. He still had his healthy family and a farm home in the country, but they still longed for the way they were. In contrast to this, we have the beast, who is materially wealthy (referred to in the text as “rich beast”), but otherwise destitute. He is all alone in his big home, is visibly unattractive and thusly unhappy. In most of the “Beauty and the Beast” tales, there is usually some sort of intrusion by the father upon the beast, under the guise of retrieving a gift the youngest “Beauty” asked for. This tale is no different in that regard. The merchant takes a limb of roses home that Beauty requested from his journey. Ironically, Beauty only asked for this gift to be less troublesome than her sisters who wanted rich gowns and expensive gifts! Beauty was the only one content in the country and working hard on the farm, but she ended up being the reason the family is rescued from that life, as her union with the Beast allowed the family to regain their social status. The literary symbols used in this tale are: the child redeemer, disproportionate retribution, and among many others the use of a “curse escape clause” (The Beauty and The Beast). The idea that the child is the only savior for the whole family is the use of the child redeemer archetype. The merchant being punished with either death or the loss of his daughter seems to be disproportionate retribution for the taking of a few roses. And finally, every curse needs an escape clause, and this one was no different. If the beast found someone to love him even as a beast and would agree to marry him, then the curse would be broken. It’s also important to note the lack of a maternal figure in these tales. Almost always, the father is the only parent figure in the household. The brothers also have very little input in the overall story, which is interesting, because in most adaptations there are no brothers! In this adorable adaptation, the premise is still very much about the transformative powers of love . The beast this time, however, is a three-headed winged demon snake! Fear not, because he is still a former prince. Once again the merchant is caught trespassing upon the beasts property at his beautiful daughter’s behest and forced to make a sacrifice. This tale is similar to the French tale in that the girl is sent to the castle and given every need and desire but is still missing her family. Unfortunately in this tale, the beast doesn’t wait until the curse is broken to try to get in bed with her. After he has accomplished this purpose, Beauty is given permission to go and visit the family. She leaves with the understanding that he will kill himself if she doesn’t return by nightfall. Much like the French version she doesn’t respect the curfew he has given her, and when she returns she finds the beast has indeed killed himself. She kisses one of the dead snake heads and lo and behold, her prince is healed and no longer a demon-snake thing, but a handsome prince. Many of the same symbols from the aforementioned French version are also utilized in this text. The child redeemer is still Beauty, as she is the heroine in this version. The disproportionate retribution occurs when the father trespasses on the snake’s property and in exchange for his life, he must send his daughter to live with the snake demon beast. 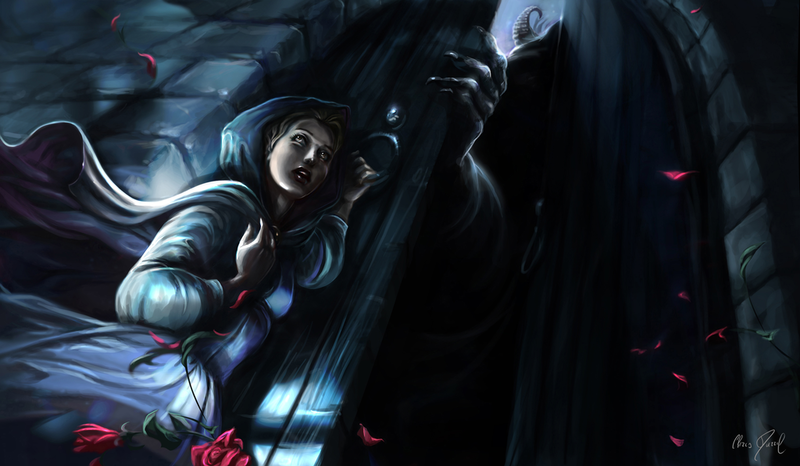 Finally, this curse also had an escape clause, because the “beast” was transformed by true love’s kiss, even in death. This tale differs from the French tale in that the prince doesn’t threaten to kill the merchant or his daughter; just his anger appears justification enough for the merchant to send his most loved daughter away. In fact, the prince seems to be slightly suicidal, proof of which is him leaping to his death at his perceived loss of Beauty. Also different than the French tale is the merchant only having 3 daughters and no sons. This story does not involve the class struggle or rather the merchant and family losing their social standing by some loss of fortune. It seems to focus mostly on them gaining a new station through the marriage. Much like the French and the Russian adaptations, the Portuguese version has a man with 3 daughters; the 3rd thought of as the most beautiful and treasured one. The man is once again going off on a journey and desires to bring back gifts for his daughters. The 3rd daughter not wanting to be troublesome and only wanting him back home safely asks for something she knows he can’t retrieve. The father once again “lucks” upon a palace. In exchange for rest and respite there he has to bring one of his daughters back to the palace (The child redeemer).This whole exchange is done only with a voice, so we don’t really know that he is a beast, but that no one is able to see the form the voice inhabits. Much like the aforementioned adaptations, Beauty grows ill-content with all the material goods and wishes to go see her family. The voice relents but says she must return after 3 days. She misses the deadline because of her sisters but does return to the castle. She finds the voice belonged to a now dying beast who curses her with death along with her sisters for their part in her lateness (Cultural Adaptations”). The literary symbols are still present, but a little twistier than the other versions. Beauty is still the child redeemer, the one who is supposed to fix the central problem of pleasing the beast. The disproportionate retribution is obvious, simply for the care of the “voice” the father has to send Beauty to live in a castle without her family. The curse escape clause is only present as the beast yells to her “Go away you tyrant for you have broken my spell!” as he lay dying (Consiglieri). He could have been transformed into whatever he was originally, or maybe he meant the spell that turned him from a beast into a voice, it’s not exactly clear. It’s the ending that contrasts the other versions so starkly. The death of Beauty instead of her happy ending is one sparsely seen in other adaptations. Also the idea that this beast is somehow less intimate with Beauty than the other versions is a big difference. We are also given no background to the Beast, except that he did transform from an omniscient voice to a dying beast. This ending leaves no happy ending for no one, no transformative love, no magical weddings, just death and unhappiness for all. The Portuguese take tardiness seriously! This story aligns with the previous tales illustrating the transformative powers of love. The transformation actually occurs in Venus, as she relented persecuting Psyche because she had proven her love for her son. Although the metaphorical “beast” character (Cupid) was never a beast, the sight of the beast figure is to the peril of the “beauty” character. Once again her sister’s warnings lead to her almost undoing. The youngest child is once again the beloved child redeemer and the heroine in the story. The idea that her beauty was so immense that it inspired jealousy even in the Gods seems to replace the jealousy the older sisters normally have in the Beauty and the Beast stories. This beauty was also the source of the disproportionate retribution the Psyche experienced (almost being forced to wed a monster) simply because she was so beautiful. The curse escape clause seems to have been Psyche’s trials and tribulations in order to find him again. All of these stories offer a different take on the Beauty and the Beast story. The variations while amusing and interesting provide a bit of insight into important norms from the cultures from which they originate. I hope my analysis of the aforementioned stories served to provide an insight into the literary symbolism of the tales I examined. Ashliman, D.L. ""Beauty and the Beast" by Jeanne-Marie LePrince De Beaumont, 1783." "Beauty and the Beast" by Jeanne-Marie LePrince De Beaumont, 1783. 1 Jan. 1998. Web. 6 Mar. 2015. <http://acacia.pair.com/Acacia.Vignettes/Happily.Ever.After/Beauty.and.the.Beast.html>. "Beauty and the Beast." (Literature). Web. 5 Mar. 2015. <http://tvtropes.org/pmwiki/pmwiki.php/Literature/BeautyAndTheBeast>. Consiglieri, Pedroso. "SurLaLune Fairy Tales: Tales Similar To Beauty and the Beast." SurLaLune Fairy Tales: Tales Similar To Beauty and the Beast. SurLaLuneFairyTales.com. Web. 1 Apr. 2015. <http://www.surlalunefairytales.com/beautybeast/stories/maidenbeast.html>. "Cultural Adaptations." Beauty and the Beast. Weebly. Web. 5 Mar. 2015. <http://beautyadaptions.weebly.com/cultural-adaptations.html>. Bingley. "Myths and Legends - The Tale of Cupid and Psyche." AboutEducation. About.com, 1 Jan. 2015. Web. 5 Mar. 2015. <http://ancienthistory.about.com/cs/grecoromanmyth1/a/mythslegends_4.htm>.